When Captain Barnabas Quinnell, late of the defeated Confederate army, decides to smuggle rifles into Mexico, it seems like a simple, straightforward and profitable enterprise. He hasn’t counted, though, on the Mexican officer who had been charged with putting an end to such gun-running. When Colonel Lopez and Captain Quinnell come face to face, only one of them with emerge alive from the bloody confrontation. Although this is the first book published under the author name of Jack Tregarth I've read, it is not the first I’ve read by the man behind this pseudonym; Simon Webb. Webb writes under a variety of pen-names and I’ve read only a handful of his output but so far have enjoyed them all, and that includes this one. The story switches regularly between Lopez and Quinnell, both well drawn characters as are some of the men serving under both. At no time are you ever sure of whom will be victorious when they meet as destiny brings them to a river crossing for a prolonged and well written final battle that takes place over the last thirty pages of the book. Like other stories I’ve read by this writer the tale moves forward at a very swift pace. There’s a couple of surprises as the main characters attempt to fulfil their dreams and neither are above using a little deception to achieve their goals even when they know it could lead to their deaths without warning or mercy. 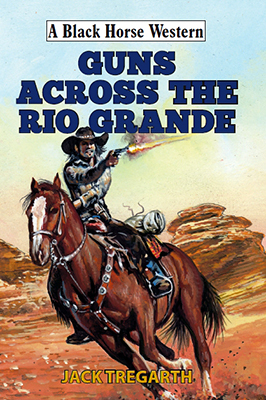 Guns Across the Rio Grande left me feeling thoroughly entertained and looking forward to reading more by this author. With every release, Tell Cotten’s army of fans increases, all of us eager for each new book and once that is read we immediately anticipate the next in this exciting series. Yes, the Landon Saga is a series, one that carries some storylines over into the next book, that often refers to what has gone before, meaning it is probably best if you read them in order. Having said that Tell Cotten does include a little background to his characters before the story begins thus meaning you can read, and enjoy this book without having read the rest. This story follows the continuing fortunes and misfortunes of Rondo Landon and Lee Mattingly, with most of the tale told in the first person through Rondo. When switching to scenes that don’t involve Rondo, Cotton tells his story in the third person. The blend from first to third and back again is so smoothly done you don’t notice it’s happened. 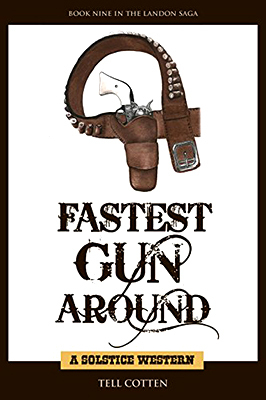 Filled with plenty of action, how-they-going-get-out-of-that situations, twists and turns, some comical laugh-out-loud moments in both dialogue and the antics revolving around the odd horse (which the author explains in a note at the end) and you have everything anyone could ask for in a western. Once again Tell Cotten proves to me that I am right in saying he is one of the best Western writers working today and if you haven’t read him yet then I’ve got to ask why not as I’m sure all fans of this genre will enjoy his stories and then be joining me, and countless others, looking forward to the next in the series, Midway. Available as an ebook too. 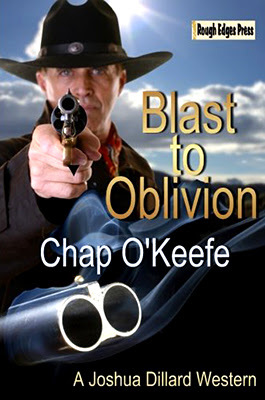 Originally published by Robert Hale as part of its Black Horse Western line in 2009, Blast to Oblivion is the seventh (of nine) books following the adventures of Joshua Dillard. Included in this revised edition for Rough Edges Press, Chap O’Keefe has added an afterword titled From Deerstalker to Stetson that explains how this story was inspired by the classic Sherlock Holmes novel The Valley of Fear. Having read many other Chap O’Keefe books I knew I would be in for an entertaining read with this one, and as it turns out it is one of the authors’ best. You don’t need to have read any of the other Dillard books as it is a self-contained novel that is full of twists and turns, great characters of both sexes, and moves forward at a terrific pace. The mystery elements will keep you guessing as Dillard has to sort deception from the truth before a final dramatic shoot-out in a location that could become a death-trap for all involved. If you missed this book the first time it was published then now is your chance to rectify that by grabbing a copy immediately as I’m sure all who enjoy well-told westerns stories will find much to appreciate in Blast to Oblivion and will then be on the lookout for the other Joshua Dillard tales. Availabe as an ebook too.